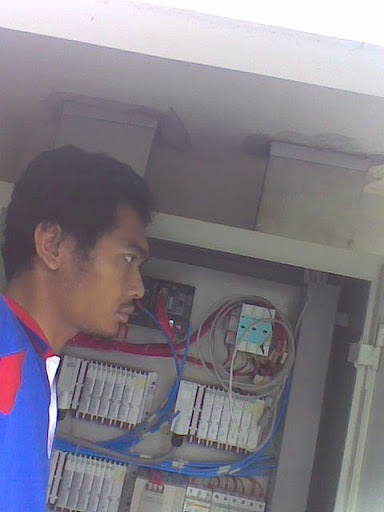 I don’t see anything in ladder logic. The PID loop operates outside of the PLC ladder logic. 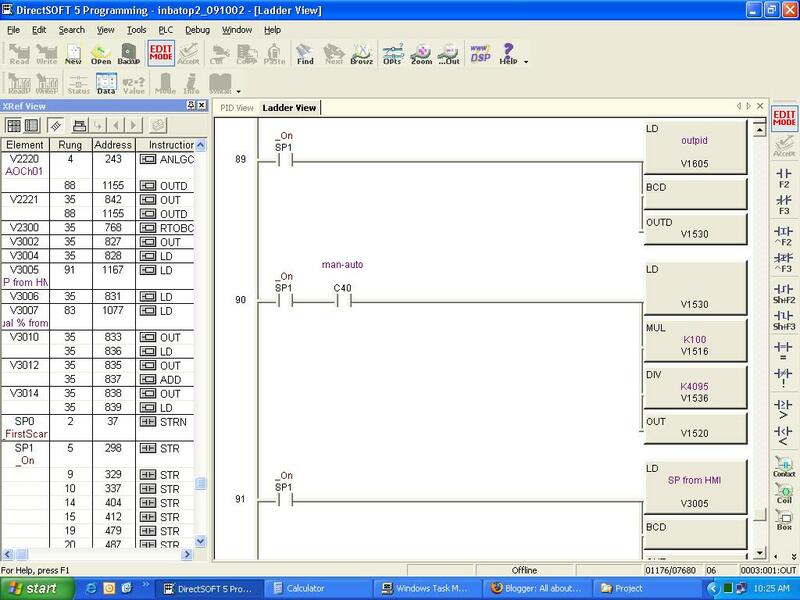 You can use ladder logic to interface with the PID loop. Most setups will use some ladder logic. ler algorithm, the controller can provide control action designed for specific process requirements. The response of the controller can be described in terms of the responsiveness of the controller to an error, the degree to which the controller overshoots the setpoint and the degree of system oscillation. Note that the use of the PID algorithm for control does not guarantee optimal control of the system or system stability. A familiar example of a control loop is the action taken to keep one’s shower water at the ideal temperature, which typically involves the mixing of two process streams, cold and hot water. The person feels the water to estimate its temperature. Based on this measurement they perform a control action: use the cold water tap to adjust the process. The person would repeat this input-output control loop, adjusting the hot water flow until the process temperature stabilized at the desired value. This section describes the parallel or non-interacting form of the PID controller. For other forms please see the Section “Alternative notation and PID forms”. gain. Despite the steady-state offset, both tuning theory and industrial practice indicate that it is the proportional term that should contribute the bulk of the output change. degree of non-linearity and so parameters that work well at full-load conditions don’t work when the process is starting up from no-load. This section describes some traditional manual methods for loop tuning. The choice of method will depend largely on whether or not the loop can be taken “offline” for tuning, and the response time of the system. If the system can be taken offline, the best tuning method often involves subjecting the system to a step change in input, measuring the output as a function of time, and using this response to determine the control parameters. 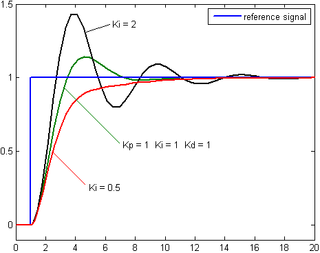 If the system must remain online, one tuning method is to first set Ki and Kd values to zero. 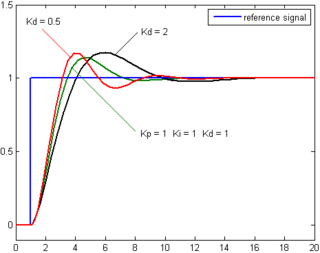 Increase the Kp until the output of the loop oscillates, then the Kp should be left set to be approximately half of that value for a “quarter amplitude decay” type response. Then increase Ki until any offset is correct in sufficient time for the process. However, too much Ki will cause instability. Finally, increase Kd, if required, until the loop is acceptably quick to reach its reference after a load disturbance. However, too much Kd will cause excessive response and overshoot. A fast PID loop tuning usually overshoots slightly to reach the setpoint more quickly; however, some systems cannot accept overshoot, in which case an “over-damped” closed-loop system is required, which will require a Kp setting significantly less than half that of the Kp setting causing oscillation. Mathematical PID loop tuning induces an impulse in the system, and then uses the controlled system’s frequency response to design the PID loop values. In loops with response times of several minutes, mathematical loop tuning is recommended, because trial and error can literally take days just to find a stable set of loop values. Optimal values are harder to find. Some digital loop controllers offer a self-tuning feature in which very small setpoint changes are sent to the process, allowing the controller itself to calculate optimal tuning values. Setpoint weighting uses different multipliers for the error depending on which element of the controller it is used in. The error in the integral term must be the true control error to avoid steady-state control errors. This affects the controller’s setpoint response. These parameters do not affect the response to load disturbances and measurement noise. controllers in non-linear systems (such as HVAC systems) is variable. Often PID controllers are enhanced through methods such as PID gain scheduling or fuzzy logic. Further practical application issues can arise from instrumentation connected to the controller. A high enough sampling rate, measurement precision, and measurement accuracy are required to achieve adequate control performance. Liptak, Bela (1995). Instrument Engineers’ Handbook: Process Control. Radnor, Pennsylvania: Chilton Book Company. pp. 20–29. ISBN 0-8019-8242-1. Van, Doren, Vance J. (July 1, 2003). “Loop Tuning Fundamentals“. Control Engineering (Red Business Information). http://www.controleng.com/article/CA307745.html. Sellers, David. “An Overview of Proportional plus Integral plus Derivative Control and Suggestions for Its Successful Application and Implementation” (PDF). http://www.peci.org/library/PECI_ControlOverview1_1002.pdf. Retrieved 2007-05-05. Graham, Ron (10/03/2005). “FAQ on PID controller tuning“. http://web.archive.org/web/20050206113949/www.tcnj.edu/~rgraham/PID-tuning.html. Retrieved 2009-01-05.
jian tenan…..buku berjalan PID rek….aku diurui po'o…. May I have a copy of your article?that's will be good for my reference on my website. @mortgage refinancing.thank you very much for your inspiring.i hope that your blog will bigger too. tubal reversal | tubal ligation reversal | tubal reversal surgeryHey great stuff, thank you for sharing this useful information and I will let know my friends as well. siiippp… keren gan infonya… Happy Blog walkiing…. 4.10.2012 13:34This is like my fourth time stopping over your Blog. Normally, I do not make comments on website, but I have to mention that this post really pushed me to do so. Really great post . This web site is really a walk-through for all of the info you wanted about this and didn’t know who to ask.Certainly a fantastic piece of work … It has relevant information. Thanks for posting this. ga mudeng niee…kurang mengertiiiiii gan..
keep writing brother, I'm sure this blog will bigger one day couse focused to one niche. Tuning a control loop is the adjustment of its control parameters (gain/proportional band, integral gain/reset, derivative gain/rate) to the optimum values for the desired control response. that is a function of the proportional gain and the process gain.